What changes make the 2019 Honda HR-V different? Updated styling, new trim levels, and first-time availability of Honda’s top safety features. Model-year 2019 marks the midcycle refresh of Honda’s entry-level crossover SUV. Introduced as a 2016 model, the HR-V competes in the burgeoning subcompact-crossover class, trading on affordability, a spacious-for-its-size interior, and Honda’s strong reputation for reliability and resale value. For ’19, this five-seat hatch gains trendy Sport and new flagship Touring trims, more sound deadening, and Apple CarPlay and Android Auto connectivity. Most important, the Honda Sensing suite of safety systems, which includes autonomous emergency braking, becomes standard on the top three of its five trim grades. Gone is the manual transmission that had been available on some front-wheel-drive models. Growth in the subcompact-crossover SUV segment is strong, with sales up 45 percent through June 2018. The class has 15 entries, including the new-for-2018 Ford EcoSport, Hyundai Kona, and Nissan Kicks. The volume leader is the redesigned 2018 Subaru Crosstrek, followed by the Jeep Renegade, Chevrolet Trax, and in fourth place, the HR-V.
Buy a 2019. It has the styling and feature set that’ll see this crossover through to its next full redesign, likely for model-year 2022. The 2020 HR-V won’t change beyond a possible new color choice or two, but it is almost certain to cost more. The 2019 model lineup should carry over for ‘20, too, starting with the base LX, the new-for-2019 Sport, the volume-selling EX, the leather-upholstered EX-L, and the added-for-’19 flagship Touring. All ’19 HR-Vs again share a four-cylinder engine and a continuously variable automatic transmission (CVT), and are available with a choice of front-wheel drive or all-wheel drive (AWD). The engine is unchanged, but Honda says the CVT is recalibrated to behave more like a conventional automatic transmission. Yes, mainly in front, where the ’19 HR-V adopts Honda’s latest brand look. It’s highlighted by the automaker’s new “flying wing” grille with a chrome crossbar and large “H” logo in place of a multi-rib design with a smaller “H.” The grille opening is enlarged to suggest a wider stance and the lower fascia is sculpted for a more aggressive look. All models now have LED daytime running lights. The tail looks more upscale thanks to new smoked turn-signal lenses linked by a thin chrome band. Exterior differences between the facelifted 2019 HR-V models include unique glossy black trim, honeycomb-patterned grille, chrome exhaust tip, and exclusive 18-inch wheels on the Sport grade. The Touring also gets a honeycomb grille, adds exclusive bi-LED headlights and LED fog lamps, and body-colored exterior trim. Like other HR-Vs, except for the Sport, it has 17-inch alloys, although they’re of an exclusive style. Other distinctions across the line include body-colored mirrors with integrated turn signals on EX, EX-L, and Touring models. Orange Burst and Midnight Amethyst metallic and Platinum White Pearl are new exterior hues. Inside, the most notable 2019 change is a revised touchscreen infotainment system. Audio volume is now adjusted with a good old-fashioned knob rather than by a touch-sensitive virtual slider (a redundant volume control remains on the steering wheel). Standard on all but the LX, this update of Honda’s Display Audio system uses a 7-inch screen and integrates Apple CarPlay and Google Android Auto. The LX retains a 5-inch screen with a volume knob. The Sport’s cabin has a blackout headliner, a leather-covered steering wheel and shifter, metal-accented pedals, and contrast stitching for its cloth upholstery. Leather upholstery is exclusive to the EX-L and Touring, the latter dressed out with double-stitched perforated hides. Honda addresses an HR-V shortfall by adding more sound-deadening in the fenders and floor and, on all but the LX, by fitting active noise cancellation. Size wise, the ’19 HR-V remains smack-dab in the middle of the segment, although passenger room and comfort are among the best the competitive set. So is cargo volume, at 24 cubic feet behind the rear seat and 58 with it folded. The HR-V is essentially a slightly inflated version of Honda’s Fit subcompact hatchback car and shares with the Fit the automaker’s Magic Seat. This rear bench has seatbacks that fold flush with the cargo floor, a convenience lacking in many rivals. Its bottom cushion tips to create a body-width space behind the front seats. The front-passenger seatback folds rearward to accommodate long items, such as skis. Yes, tweaks to the CVT and AWD and to the Sport model’s steering. The sole engine, a 1.8-liter four-cylinder, retains 141 horsepower and 127 pound-feet of torque. That output is class-competitive but that’s not saying much: snappy acceleration isn’t a hallmark of the segment. At about 9.5 seconds 0-60 mph with AWD, the HR-V is merely midpack and no faster than the average economy car. Discontinued is the seldom-ordered six-speed manual transmission previously available on the front-drive LX and EX. That leaves a CVT as the sole transmission. Like others of the type, Honda’s CVT eschews the stepped gear ratios of a conventional automatic transmission for a rheostat-like power delivery. Honda says it has addressed specific shortfalls by retuning the CVT to mimic stepped gear changes during full-throttle acceleration and to provide a degree of engine braking during deceleration and better throttle response when the driver gets back on the gas. This isn’t an off-road-oriented crossover. Ground clearance is modestly carlike, at 6.9 inches with AWD (it’s 7.3 inches with front-drive). The AWD system is mostly intended to furnish extra traction on snowy pavement or in loose gravel by automatically shuffling power to the rear wheels to quell tire slip. Honda says it’s been modified for better performance in low-traction conditions. The HR-V should continue among the sportier-handling subcompact crossovers, with controlled body lean in fast turns and a reasonably composed ride over bumps. The new Sport shares its suspension tuning with the other HR-Vs but its larger tires afford a meatier contact patch that should enhance cornering grip. And it becomes the only ’19 HR-V with variable ratio steering. It’s intended to improve steering response at lower speeds and steering stability at higher speeds. It decreases marginally, possibly do to a combination of measurement accuracy and slightly heavier curb weights. With front-wheel drive, 2019 HR-V EPA ratings are 28/34/30 mpg city/highway/combined. Compared with model-year ’18 ratings, that’s lower by 1 mpg in the combined category. Yes. Most notable is addition of the Honda Sensing suite of driver-assistance features. 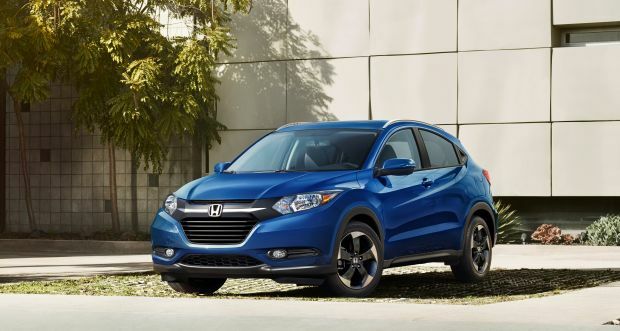 Its highlight is autonomous emergency braking designed to stop the HR-V automatically to avoid a frontal collision. The suite also includes lane-departure warning with lane-maintaining automatic steering correction and adaptive cruise control to maintain a set distance from traffic ahead. Honda Sensing is standard on the EX and Touring, but unavailable otherwise. Not available on any HR-V is blind-spot alert or rear cross-traffic detection. However, Honda adds as standard on every model, save the LX, its LaneWatch video monitor that can project onto the dashboard screen a live image of the right-side blind spot. In addition to the aforementioned changes, new HR-V features include technology that automatically locks the doors when it detects the keyfob is no long near the vehicle; the “walkaway” locks are standard on all but the LX. The 2019 Touring replaces HR-V’s former flagship, the EX-L with Navigation model. It becomes the only HR-V with imbedded GPS navigation and also the only one with a power driver’s seat. They increase roughly $200-$1,500 for returning models, with the Touring priced $2,255 above the previous top-of-the-line EX-L with Navigation. The HR-V is priced on par with most rivals of similar spec. Per Honda custom, there are no factory option packages, though, so you may need to step up to a more expensive trim level to get a feature you desire. Prices here include Honda’s $995 destination fee. The 2019 HR-V LX is priced at $21,515 with front-wheel drive and at $22,915 with AWD. Among its standard equipment is a rearview camera and a manual driver’s-seat height adjuster. The ’19 Sport is priced at $23,215 with front-drive and $24,615 with AWD. It adds roof rails, in addition to the features noted earlier. 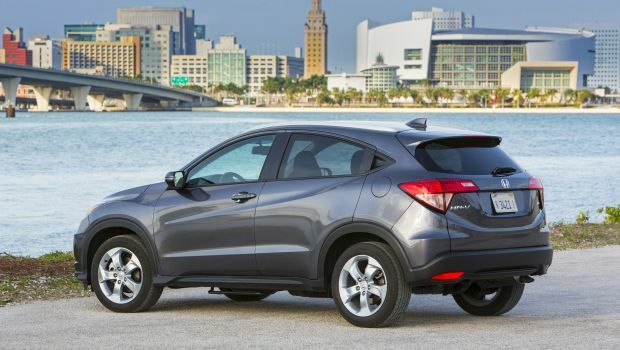 Honda prices the ’19 HR-V EX at $24,715 with front-drive and at $26,115 with AWD. It builds on the Sport with a moonroof, keyless entry with pushbutton start, rear privacy glass, heated front seats, automatic climate control, variable intermittent windshield wipers, lighted vanity mirrors, and automatic headlamps. Priced at $26,315 with front-drive and at $27,715 with AWD, the EX-L adds to that an automatic-dimming rearview mirror, plus leather-trimmed seats, door linings, steering wheel, and shift knob. The ’19 HR-V Touring model is priced at $29,535, including AWD, and comes with the earlier-noted navigation and LED lighting, plus a HomeLink garage-door transmitter.